Welcome to Kennel Green Perry’s homepage! Working Champion C.I.B. 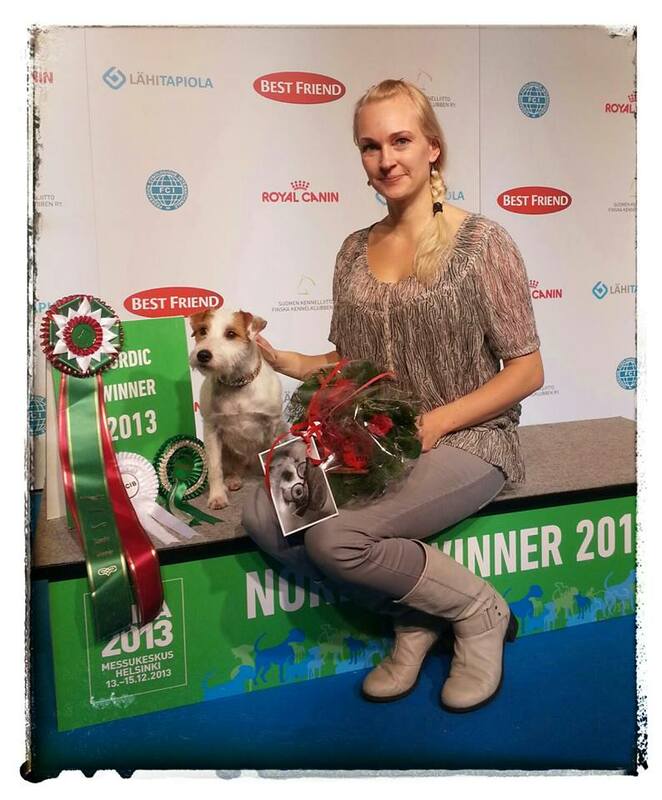 FI & NO & LV & LT CH Balt & EE & LV & LT jCH Nordic Winner-13, TLNW-12, Fi JW-11, EE JW-11, BaltW-11, BalterWinner -11 Green Perry’s Butterfly ”Luru” and me in Nordic Winner show 2013 in Helsinki. Kennel Green Perry’s is established 1999. We are located in capital area in Finland, Espoo. Our dogs life as family pets. All our breeding dogs are living in their own homes. Kennel Green Perry’s is awarded with highest recognition of excellent breeding for breeders from Finnish Kennel Club, Vuolasvirta trophy in 2013. Green Perry’s parson russell terriers in Finnish Kennel Club database. Green Perry’s spanish waterdogs in Finnish Kennel Club database. Me in April 2014 with (from left) TLNjW-12 Green Perry’s Milk Maid ”Milka”, C.I.B. IE & LV CH Torlishill Its A Kinda Magic ”Bandit”, Working Champion C.I.B. FI & NO & LV & LT CH Balt & EE & LV & LT jCH Nordic Winner-13, TLNW-12, Fi JW-11, EE JW-11, BaltW-11, BalterWinner -11 Green Perry’s Butterfly ”Luru”, Green Perry’s Bandit’s Bay ”Melu” and Green Perry’s Disco Dancer ”Kide” 15 weeks.